If you were ever a kid, I’m sure you knew what it was like to grow up on peanut butter and jelly sandwiches. I mean it was like the ONLY thing I ever wanted to eat when I was like 8. There is just something about those two flavors that brings back childhood memories. Now that I’ve grown up and have kids myself who are literally obsessed with peanut butter and jelly sandwiches I kind of started to grow bored with them. I mean yeah, they are quick and easy and kinda just are a good thing to whip together when you have nothing better to make. But literally that can get old and too “routine” if you know what I mean. So when I was rifling through my cabinets and refrigerator the other day to find something to use up my extra dough I had made I found some peanut butter and jelly and went hmmmm….maybe this could work. 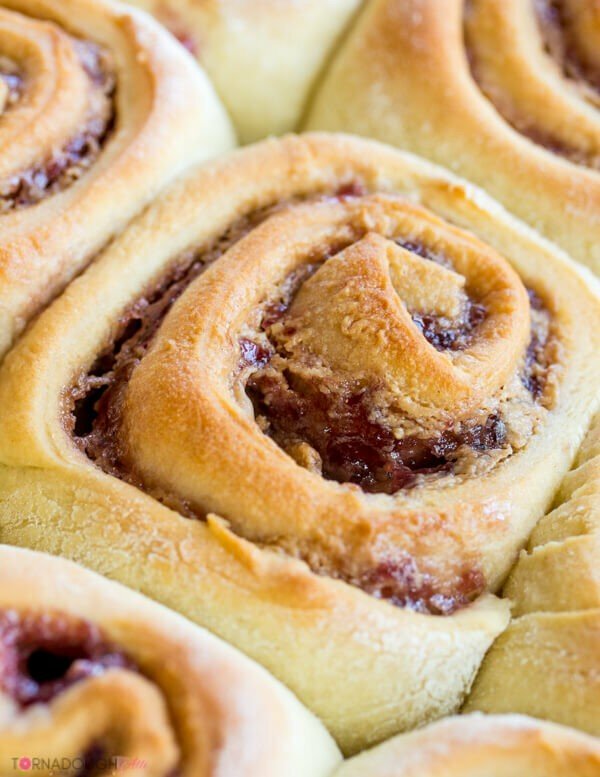 Let me tell you my friends…these Peanut Butter and Jelly Rolls are THE BOMB! I had one of my closest friends come over and visit me the day when I was baking them and she told me that they are so much better than the traditional peanut butter and jelly sandwiches, WHAT?!?! But this is also the friend who showed me that putting peanut butter on one slice of bread and jelly on the other slice of bread made more sense, so I can totally trust her judgement. I mean she solved the messiest problem I’ve had in a long time! I know…third world problems right there! Anyways, this recipe is super simple. 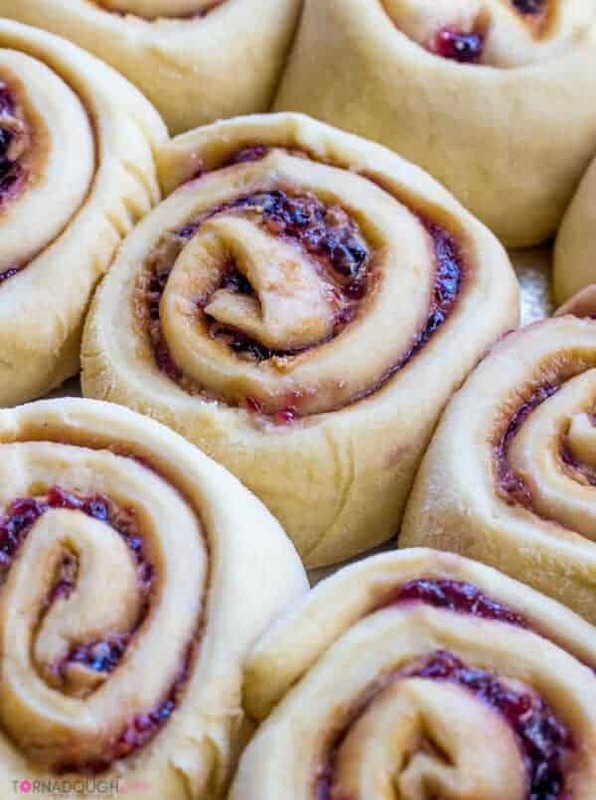 You make some dough then you spread it with peanut putter, dollop some jelly and swirl it around, bake it up and top it with a little glaze and you have yourself a big pan in individually rolled pb and j sandwiches. I bet if you sent these bad boys to school with the kiddos they would be the most popular ones around. I totally don’t know if that’s how it would be, but I know I would want to trade my snack pack for on of these bad boys, for real!! 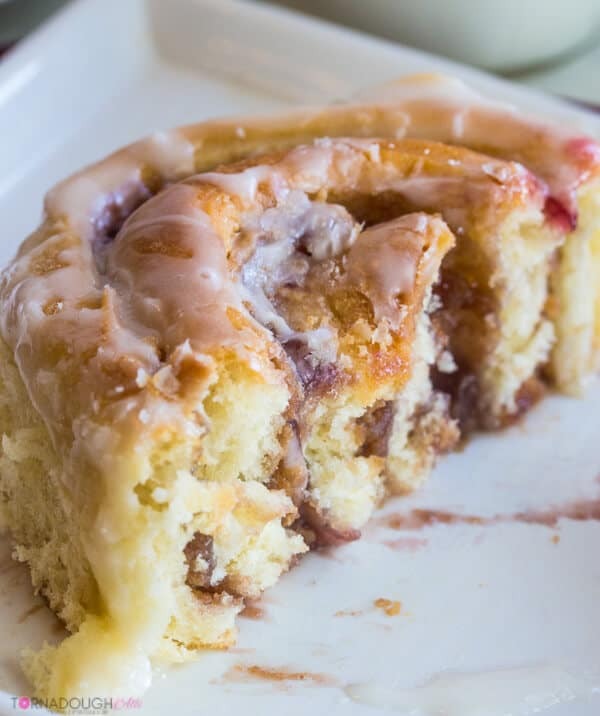 Plus the glaze over the top makes the Peanut Butter and Jelly Rolls just that much better. 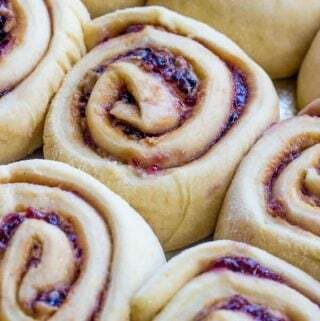 Sooooo, if you’re looking for a something a little different to add to your lunchbox then I highly recommend giving these Peanut Butter and Jelly Rolls a try, they are fun for adults and kids alike and they will be gone in no time! In large bowl, combine 1 1/2 cups flour, 1/4 cup sugar and salt, set aside. In a sauce pan or bowl in microwave melt your butter and milk until warm. Let cool to about 110 degrees and add your yeast to proof. Once yeast has proofed add your milk and butter mixture along with your egg to your flour mix. Stir to combine add more flour 1/2 cup at a time until dough starts to pull away from bowl. Dump out onto lightly floured surface and knead until dough is smooth and elastic adding in additional flour as needed, about 5 minutes. Spray bowl with non-stick cooking spray and add your dough and cover and let rise in warm place until doubled. Once doubled in size dump your dough out onto lightly floured surface and roll out into a 12"x15" rectangle. 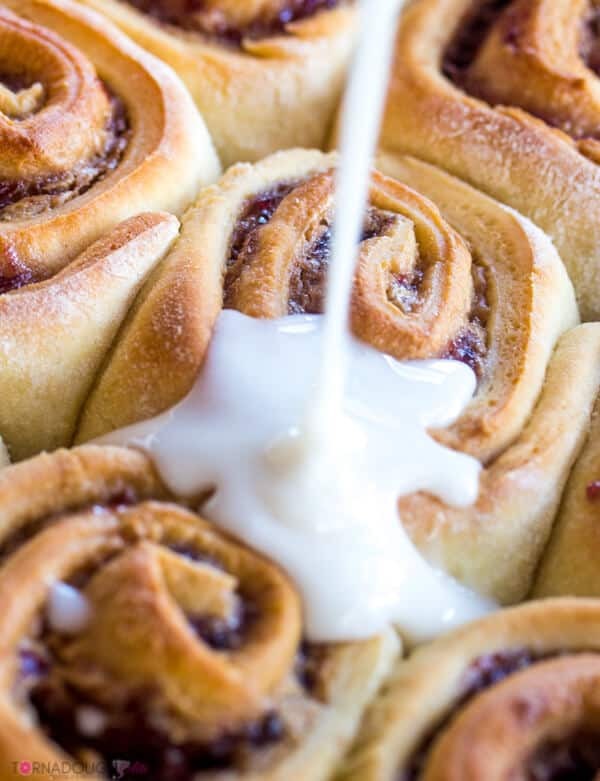 Spread peanut butter over your dough until almost to sides, then dollop your jelly over top swirling around and spreading as good as you can. From long side, roll your dough up, cut off edges and then cut into 12 equal rolls. Place rolls cut side up in a greased 9"x13" pan and cover again and let rise until doubled. Once risen preheat your oven to 350 and bake for about 20-25 minutes or until golden. Meanwhile to make your glaze combine all ingredients in bowl and mix adding more milk to get your desired consistency. Once rolls are cooled slightly, spread your glaze over tops and then serve. 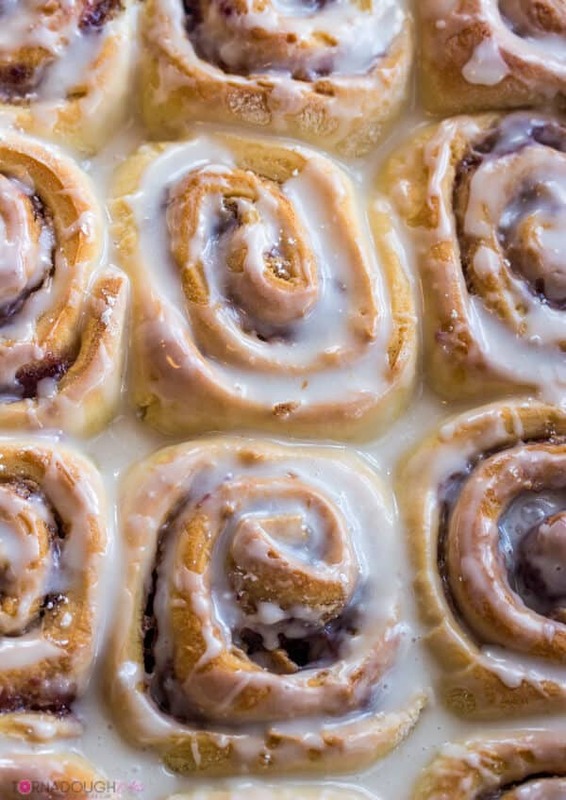 where are the White Chocolate Cranberry Sweet Rolls that are in the title on Pinterest? 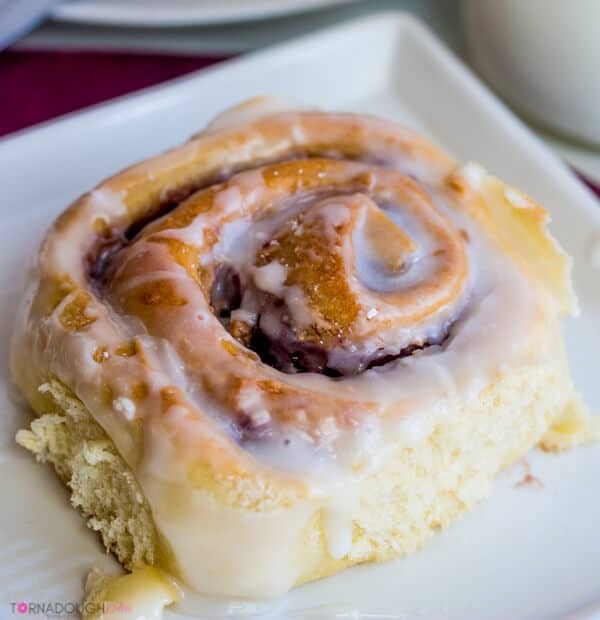 That must be a Pinterest error, unfortunately I don’t have any White Chocolate Cranberry Sweet Rolls on my website, sorry about that Cindy.